The Li-Si, Ag-Ca, B-Li, Ca-Li, and Al-Li alloys belong to the group of materials which have an applicable character. However, there is no available literature calorimetric data for these systems. "Iuventus Plus" project makes possible to create a new database of thermodynamics properties of alloys from Li-Si, Ag-Ca, B-Li, Ca-Li, and Al-Li systems. 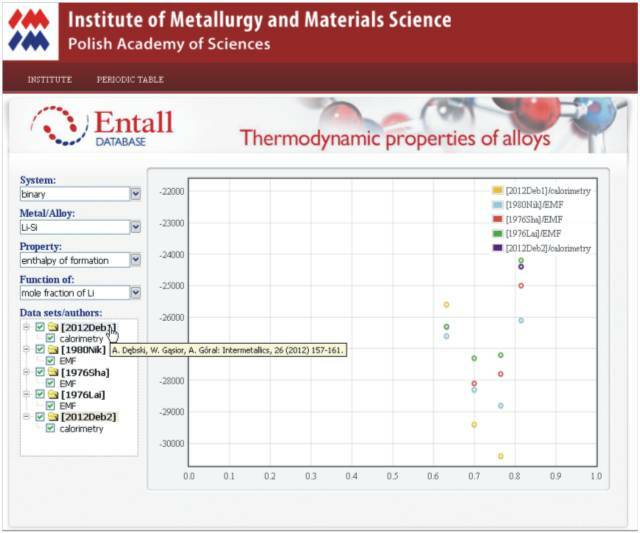 Entall database contains the experimental data of formation enthalpy of intermetallic phases from these systems and the software, which allows to calculate other thermodynamic functions. Entall database is free of charge and is available on the website: www.entall.imim.pl. The authors wish to express their gratitude to the Ministry of Science and Higher Education of Poland for funding Project No. IP2011 009871"Thermodynamics of alloys for safe hydrogen storage and energy", financed from the budget for science in the years 2012-2013.